Take that, wood! Get out of town, laser-fused nylon! Run to the funny farm, loopy steel stays! Because after three relentless weeks of challenges to its reputation as the most exotic type of material for a frame, carbon fibre has hit back with a huge loom whose sinister, silky precision will instantly mesmerise every hater of the dark stuff. Yes, the clip below is made by a car manufacturer, but it is surely only a matter of time before this robotic method of production becomes the norm for bike frames – and when the machines finally take over, friends, you can bet your Madone there will be a reappraisal of the traditional artistry of Taiwanese sweatshop workers. A confession: The DYNAMITE! Files has never been privy to a conversation where “ankle” has been deployed as a verb – but apparently somebody, somewhere frequently uses the term to describe “flexing the ankles while cycling in order to increase pedalling efficiency”, because the phrase was given its very own entry in the Oxford English Dictionary this week. For the 2012 edition, the OED’s lexicographers might want to include a word most cycle fans actually recognise, such as “packing”, “glass-cranking” or, er, “suitcase” (noun: a storage device for courage, as used by ITV’s Paul Sherwen). “Did a training ride/race today. It went well/didn’t go well. Roll on the next training ride/race!” If the standard formula of pro cyclists’ tweets are beginning to tire you, then you obviously haven’t heard (ring the lap bell!) 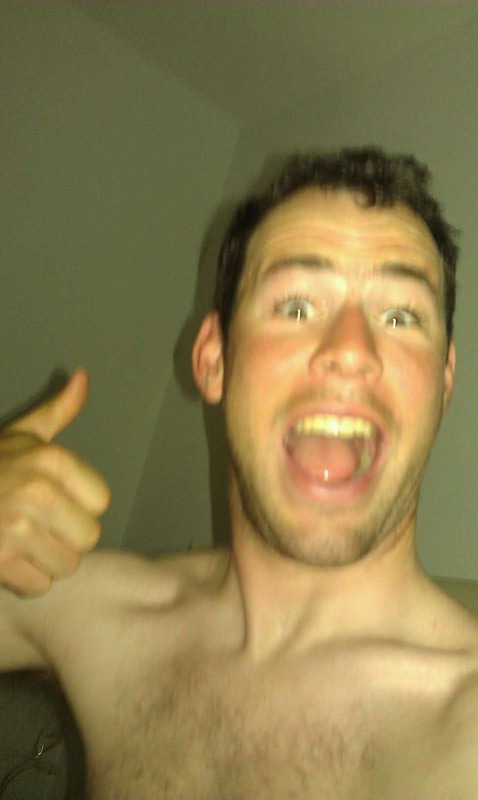 that Mark Cavendish finally made his Twitter debut this week. Subjects so far include weird Italian fashions, poor air travel etiquette, the indignity of the massage table and a re-enactment of a scene from Lord of The Rings. Easily the funniest and most engaging professional cyclist in the Twitterverse, and he hasn’t even raced since signing up. Raise your Twitter game, Fabian! Bad news for track fans who are deep-of-pocket yet slow-off-the-mark: your chance of spending £325 for the privilege of watching less than three hours of cycling has all but vanished. But don’t despair, because although the events at the Olympic velodrome were sold out by the end of the Tuesday night deadline, you may just be able to pick up a ticket or two for the men’s road race. Yes, you’ll be paying £60 for what is otherwise a free event, but you’ll be able to tell your grandchildren you listened to some national anthems you probably never heard before while the medals were given out. And that, chums, is priceless. On the subject of witnessing unique moments, a 16-year-old boy won the first Crystal Palace elite race of the season on Tuesday night. Naturally, most of the tweeting about that notable evening has centred around the subsequent arson attack that destroyed the organisers’ equipment, but even so, there seemed to be a conspicuous lack of amazed comments that accompanied Germain Burton’s win. Perhaps that’s because the teenager has pedigree (his dad is British track legend Maurice Burton) and he’s already won the Bec Hill Climb, which makes his win seem less surprising. Or could it be that the Palace regulars don’t like mentioning they were beaten by a schoolboy? Surely not! This entry was posted on	April 29, 2011 at 4:41 am	and is filed under The DYNAMITE! Five.